On the cusp of the new generic top-level domain application period, ICANN Chairman Peter Dengate Thrush tells WTR that the trademark community may have delayed the process enough and that the board may be ready to force it into submission. To achieve success in pleading before the Trademark Trial and Appeal Board (TTAB), it is important to understand the differences between opposition proceedings in the United States and Europe, as well as grasping the intricacies of TTAB proceedings themselves. Successful navigation of the system can not only increase your chances of success, but also save money. 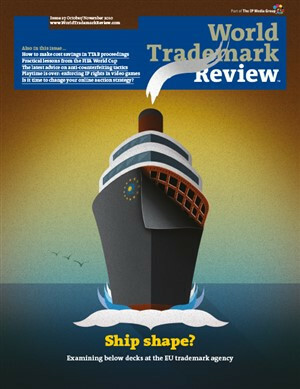 Trademark law is not practised in a bubble. Smart trademark counsel know that their team must dovetail with other departments in order to meet the companys strategic objectives. They also understand that beyond the registration certificates lies a world where brands brighten up store shelves and billboards. The in-house trademark counsel is a nexus not just between internal teams, but also with the outside world. It is thus vital that trademarks are viewed in their wider commercial and political context. Community trademark courts - dream come true or work in progress? It has been a busy year in Alicante. While efforts to tackle the backlog of opposition files and long processing times continued, the Office for Harmonisation in the Internal Market (OHIM) also launched TMview, unveiled and implemented the initial framework within which national offices and users can apply for support from the 50 million OHIM Cooperation Fund, found itself proposed for potential anti-counterfeiting responsibilities and appointed a new president (the latter resulting in questions over the selection process after just one name was forwarded for consideration by the European Council). A judge in the US Court of Appeals for the Ninth Circuit has handed the Bratz doll brand back to MGA Entertainment, overturning the district courts earlier judgment after which Mattel claimed victory. The Colombian registry behind the widely marketed ‘.co’ toplevel domain name has reiterated that it will continue to champion the rights of trademark owners. Anheuser-Busch InBev has failed in its 14-year effort to register its famous BUDWEISER mark as a Community trademark (CTM) in the European Union. The Court of Justice of the European Union (ECJ) ruled on July 29 that Budejovický Budvar’s earlier rights in Germany and Austria were sufficient to show genuine use of the mark in the Community and could therefore block AB InBev’s application. The process to reach consensus on the trademark protection mechanisms proposed for the new generic top-level domains (gTLDs) has encountered another delay, just ahead of September’s expected decision on the matter. WTR presents a round-up of news from around the globe. Rumours recently circulated that the trademark function would be spun off from India's patent and trademark office. With the office still burdened with a significant backlog of work and accession to the Madrid Protocol looming, would such a move be a help or a hindrance? Let's face it: we are not yet winning the war against counterfeit products. Despite the introduction of stronger laws with tougher penalties, improved enforcement resources and better training for customs officers in intercepting and identifying fakes, each year the illicit trade expands. This has led to a growing belief that the fight cannot be won solely by measures aimed at disrupting the supply of such goods. The need for the Indian legislature to recognise publicity and image rights in a statutory manner has never been greater. Celebrities increasingly seek to protect their publicity and image rights due to the rising commercial value of their fame and identity. Although publicity and image rights might appear to have most in common with copyright, of all IP rights, this is not in fact the case. Copyright concerns property, whereas publicity rights concern privacy. The use of images may or may not be commercial – commercial use comes to mind when the image of a famous person is used. A number of legal protections are available for the protection of publicity and image rights. Italian law provides strong protection for personal names and portraits as trademarks. The relationship between image protection and trademarks is defined by the few articles in the Industrial Property Code that deal specifically with images and personal names in relation to trademarks. While national jurisprudence defends the nature of the image right as a personality right with important patrimonial value, economic exploitation can arise from the broad scope for negotiation in comparison to other personality rights. Those wishing to protect their image or name need to navigate trademark law, issues surrounding freedom of expression, the Privacy Protection Law and Unjust Enrichment Law. Image rights are fundamental rights enshrined in the Spanish Constitution, yet a number of factors hamper effective judicial protection. Legislation on image rights is becoming increasingly necessary. With the rapid development of China’s market economy and the emergence of new forms of marketing models, there is a growing interest in new forms of property rights – image rights – to deal with the growing commercial value of celebrities’ fame and identity. In Canada, personality rights enjoy common law and statutory protection, stemming from an individual’s publicity rights (which are proprietary in nature) and the right to privacy (a personal interest). In terms of common law protection, the tort of misappropriation of personality is available to individuals (outside Quebec) who have suffered economic injury as a result of the violation of their publicity rights. The forthcoming Civil Code will dramatically impact on image rights protection. The protection of image rights was first acknowledged in Romania in the 1991 Constitution, but only as a general and indirect principle (as a limit to the freedom of expression).